Easy to use, offers pretty good value. White exterior may not suit all kitchens. 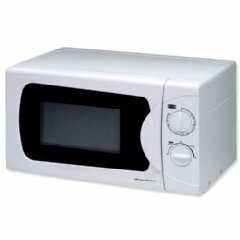 Looking for an easy to use solo microwave that doesn't break the bank? The inexpensive Igenix IG2080 could be the product for you. Featuring a 20 litre capacity and a substantial 800w power output, divided into 5 different levels, which can set via the easy to use dial system. The upper dial is used to set the mode and power level, whilst the dial underneath is used to set the time, up to a maximum of 30 minutes. The interior features a painted white cavity, measuring 21.0cm by 31.5cm by 32.9cm, and the exterior is 26.2cm by 45.2cm by 36.0cm, with the microwave weighing 12kg in total. Overall this Igenix microwave doesn't provide the same number of features as higher end models, but what it does, it does well. It's easy to operate, wipes clean pretty easily, and should be reliable. All in all the Igenix IG2080 is an inexpensive solo microwave, with an easy to use dial system, which will be ideal for the elderly.